I am convinced that Mary Anne is one of the last great ladies left in the world, she is always beautifully dressed and undeniably feminine. She’s utterly gorgeous and I have no idea of her real age because she won’t tell me. She has a laugh that’s a little bit reminiscent of the silvery bells that we were selling,I don’t believe that she’s quite of this world. Mary Anne is the kind of woman that young men follow around without knowing why because she’s absolutely mesmerizing and timeless, she’s definitely who I want to be when I finally grow up! She’s a bit like Jane Seymour’s character in that fabulous old movie “Somewhere in Time”, a woman so very mysterious and beautiful that you just don’t ever completely know who she is or where she is from. I walked in on that cold Thursday evening to find Mary Anne dressed in a softly tailored apricot colored Chanel suit, a true vintage with a lovely matching scarf and gloves. Her hair was brushed back over the nape of her neck and around her throat were the loveliest strand of pink hued natural pearls creating an effect that was shimmering,warm and perfect. As I kissed her hello and handed her a glass of Champagne, I realized that she was completely enveloped in one of the most decadent clouds of fragrance that I’d ever experienced and I could barely speak as I didn’t want to break the trance. When I finally asked her about it she just laughed and with eyes twinkling told me that it was her absolute favorite, Sisley’s Soir de Lune. The next day I went immediately to Saks and grabbed a sample to play with. Since then my life hasn’t been quite the same. So far in all of my years of lusting after gorgeous fragrance I’ve never experienced anything like this one. Soir de Lune is a passionate bombshell of a fragrance that’s barely contained within a very lady like and absolutely stunning bottle. I have had men and women alike move to hug me, sigh and subsequently bury their faces in my hair when I’m wearing it . By the time they’ve come up for air they have fallen heavily under the evening moon spell, the same way that I first did. My husband loves it and thinks that it’s the most romantic fragrance that I’ve ever worn for him, in our bed and out. Great review, Beth. Soir de Lune is one of my favorite scents, and it was the first chypre I loved. It opened the door to all those glorious chypres for this mostly oriental and floral loving sniffer. I have never tried Soir de Lune, but you make me want to try it so much and as soon as possible. Thank you for a gorgeus review. Thank you for sharing the beautiful stories about your mother and friend. (I want one of your silver bells!) Lovely review--I think I'll try to find a sample. It sounds like something DH would love. Thank you so much! I'm glad that you loved the review and have yourself fallen under the spell of Soir de Lune! It's a truly gorgeous fragrance! I'm curious to know which other Chypres you love? Thank you!!!! I'm so glad that my reveiw made you want to try this one. I think that you'll love it and please be sure to let me know! Thank you so much! I love sharing stories about mom, she was really a pretty neat woman and I am glad that your are enticed! It's easy to fall in love with this fragrance and if you find me on facebook (Beth Schreibman Gehring) I usually put the link to the bells up sometime mid October and you can have your very own! All of the profit goes straight to the education committee of the Orchestra! Please let me know if you love Soir de Lune! I really enjoyed your review, as usual. 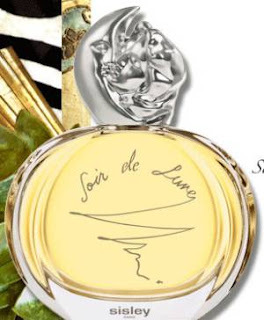 I've tried Soir de Lune and it is *definitely* a grande dame scent. So much so that I couldn't envisage wearing it, although I'm now (just!) the wrong side of 35. It's the kind of scent I aspire to but feel I can't quite carry off. I hope to one day though. and now you make me want to visit Cleveland! Try it again and let me know what you think. You may be surprised by how it works for you! Thanks so much and I'm really glad that you enjoyed the review! I would so love to show you around here. Cleveland is an amazing city, very understated and misunderstood. 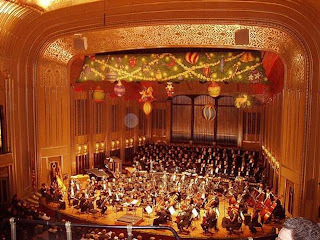 I was thrilled to find out that we are now considered to be one of the up and coming restaurant cities in America and our art museum is amazing...but Severance Hall is such a gem, I would love to take you to a concert so come for Christmas! Yay!!!! I've been jonsing for one of your wonderful reviews (for a while), and again, you don't disappoint. Beautifully written, Beth - and now you've piqued my curiosity regarding Soir de Lune.....I've passed the fragrance many a time in various stores and malls, but now I will take heed and hopefully connect to what sounds like a great fragrance. I've been in a "rose" frame of mind as of late.....how is the rose in this fragrance? You mentioned honeyed-nuances (which I also love) - how do the honey and the rose play together in this fragrance? Yum. What a delicious review, Beth -- I can't believe I have not tried this. Beth, what an amazng review....I am now craving this perfume, as well as a trip to Cleveland! I always enjoy hearing about yourl ovely mother. It's so wonderful of you to share with us, even though it surely still hurts. I have noticed that just about every recording of a symphony my husband and I love the most is invariably the Cleveland Orchestra, Jascha Horenstein and the Ninth leaping first to mind. You've inspired me to take him to Severance Hall some day. Thank you! Your reviews invariably draw me in and completely take me out of wherever I am at the moment. They're wonderfully evocative. I actually do already have and adore Soir de Lune, but if I didn't, I'd probably be on the net right now purchasing it unsniffed. And from now on I'm going to be associating it w/ magical winter evenings and that beautiful concert hall. Wow - I adored Severance Hall and the Cleveland Orchestra; both of them are just two of the things that I desperately miss about Ohio and Cleveland in particular. Lake effect snow and the long winter are not two of the things that I miss, but you can't have everything. Your lovely review managed to both warm my heart and make me horribly homesick at the same time. I definitely want to try Soir de Lune now, too - at 42, I think that I might finally be ready for some of the more grown up classics. I've recently developed an appreciation for Mitsouko, No. 5, and aldehydes, so I have high hopes that I'll love this, too. Thank you so much for your amazing words....I truly appreciate the fact that you loved my review and my God..the jonesing part was one of the most wonderful things that anyones ever said to me:)! The honey and the rose blend beautifully in Soir de Lune, neither is to heavy. In fact, none of the accords are that distinct (at least to my senses) ,they seem to blend to create a whole other being. I think that you will love it and please let me know when you try it! Thank you so much for your really sweet words. I am so glad that you enjoy the stories that I tell about mom. It's cathartic for me and I've gotten a lot of my healing from sharing her with all of you. I think that you will love Soir de Lune! I am thrilled that you love the Cleveland Orchestra and you must come an experience Severance Hall. It is truly one of the loveliest concert halls that I've ever seen and the music is extraordinary when played there. Come at Christmas! Are you close? You need this one...you truly do! It is beautiful and I know that you would be able to wear with the aplomb that it deserves. And...you would look wonderful in an apricot Chanel! Thanks for letting me know that I've done this one that we both love justice. It's an honor for me that you love my prose! Thank you! I am so glad that you loved my review of a scent that you adore. It is an amazing fragrance and it's meant for evenings just like you describe. And thank you for letting me know that you love my writing. Your compliments I treasure because those feelings are exactly what I hope to create for all of you when I write. Thank you for letting me know that i succeeded! It really means so much to me! Now I am so curious! A fellow Clevelander! I know what you mean about the lake effect snow and the extraordinarily long winters and I know that you know what I mean about Severance Hall and it's magic! Thank you for sharing your memories with me and I'm glad that you enjoyed my review. You should try Soir de Lune and be sure to write me when you do! I'll be dying to know if it evokes that magic for you! Mitsouko..another classic! I love that one too! The style of the review certainly matches that of the fragrance, which is one of those marvels one has in one's closet just in case. Thank you so much! That is high praise indeed and I'm so glad that you enjoyed the review as well as this incredible perfume! What are your "just in case" opportunities? Social magic...absolutely....Silk...Definitely!!!!!!!!!!!!! Thank's for letting me know! I always love learning about the impressions that others get from fragrance! The thought of you wearing Soir de Lune during every full moon just makes me smile:) What a wonderful ritual! Beth, you weave the best story spells--thank you for this one. This will now be added to the bundle in my head that is "Soir de Lune"...I am still wrapping my brain & nose around it...it's been a while since I sampled; tried it early in my curve, was intrigued and yet not sure...you and Severance Hall make me ready for another go. This fragtance is truly elegant; I got my first bottle a year ago, and had digressed into some other fragrance for the summer; tonight I sprayed it and wondered how I could have been without it. I decided to see if there were any new reviews, and there was your review that, I agree, I would have had to go out a get some if I did not already have it on. I spent 13 years in Cleveland in my 20's and will never forget going to Severance Hall during Szell's reign. It is magical, although at the time OI was blown away by the wall of snow on either side of the walkway to get in. Soir de Lune I will re-embrace. The first time I smelled soir de lune, my eyes became teary with emotion. I have never been emotionally moved by a perfume. It smelled like someone I must have loved very much, almost maternal for me. But not quite. I knew I had to have something this devastatingly beautiful, and purchased it right away. This is my signature fragrance and I love it. Thank you for sharing your lovely story with us. You are a talented writer. I hope you are well.